This video file was too large to load onto this page, but to view it follow this link: Working For Tomorrow. Here’s a percentage that has given eastern Idaho’s leaders in business and government some cause for concern: at Idaho National Laboratory, 30 percent of the workforce is at least 50 years old. What that means is a lot of people in jobs requiring highly specialized skills and advanced education are going to be retiring, probably sooner rather than later. It's been nicknamed the "silver tsunami," but in reality it's more like an ebb tide, and business leaders are scrambling to prime the lab’s “talent pipeline.” In the last six months, INL, local employers and REDI for Eastern Idaho, the economic development authority for 14 counties, have started a campaign to get the word out about what the region has to offer. How does one reach the best and brightest of Gen X and the Millenials? On its Web site, REDI has recently unveiled two videos, showcasing the region’s attractions. They focusing specifically on the fantastic opportunities for outdoor recreation and heartland community values where a work-life balance can be more easily attained than in places like California’s Silicon Valley or North Carolina’s Research Triangle. 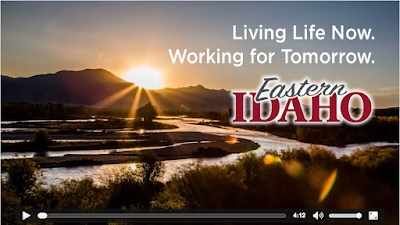 In addition to business leaders extolling eastern Idaho’s virtues, the videos feature intelligent, attractive people doing the things they love — rock climbing, kayaking, skiing, etc. There was no script, just people talking about their lives and their work. Smede admitted that while he was setting up he would hit the “record” button without informing his interview subjects. He had no plan to use any of that footage, but when the actual interview started he told them already been recording them and it seemed to put them more at ease. The videos have been posted on REDI’s Web site, http://easternidaho.org/, as well as on those of the businesses and institutions that helped with the production: INL, Idaho Steel, the Center for Advanced Energy Studies, CRI Advantage, NanoSteel, Portage, Inc., and Premier Technology. Since it is tech-savvy people they’re trying to reach, a heavy push is being made on social media such as Facebook, Twitter and YouTube, Cook said. “There’s been a tremendous response to it,” said Jan Rogers, REDI’s CEO. Businesses like Bingham Memorial Hospital have asked whether they can post the video, which is exactly the reaction they hoped to see from local employers. Like Cook, Rogers says talent attraction is the No. 1 priority. “If you can attract the talent, business will follow,” she said. “Business will not land on a place where they cannot find talent.